Welcome to our new resent projects page. Please feel feel free to browse through photos. This Hip to Gable with additional flat roof conversion is a wonderful example of what can be achieved with a loft space. 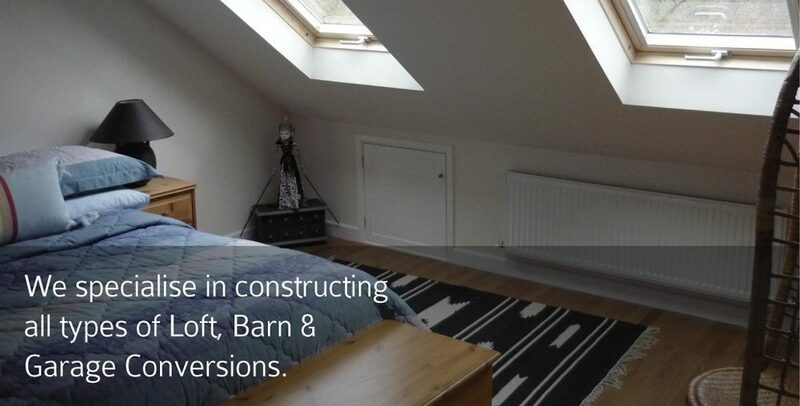 With Two large Velux windows to the font slope and a large window to the rear, we have created this wonderfully light and spacious double bedroom with walk in wardrobe and an adjoining lounge area. Our bespoke staircases are constructed to match the original so the stairs look like they have always been there, the stairs on this project look amazing ! It always amazes me where we manage to squeeze a shower room, this beautiful wet room has been installed in the eaves space on a lower level of the house. The small glass roofed side extension turned a dark and gloomy kitchen only used for cooking into this glorious living area. The tiled floor and the granite work tops complement the units beautifully and the bespoke cone shaped oak worktop is a gorgeous centre piece. A completely new roof all round, tiled with clay plain tiles to match the original roof, new soffits and facias and a new up to date flat roof system, GRP Fibre Glass with a Twenty year manufacturers warranty. All in all a fantastic project finished to the highest of standards !